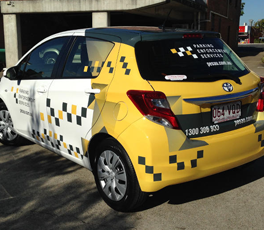 Take a look at our recently done vehicle signage for this Toyota hatchback that has now become a persuasive mobile billboard. These signage features blend in so well that they look absolutely natural across the body and the roof lines. If you have kept a fixed budget aside for your upcoming business marketing campaign, allow us to work out a suitable vehicle signage package for you. Alpine Signs can go the whole hog to understand your vehicle signage requirements so as to come up with something you can call true reflection of your brand. Get in touch with us to avail of vehicle signage solutions at highly competitive prices.